Bree Hill is a Coillte forest which is noted for its aesthetic and recreational value. The geology of the hill is Ordovician rhyolite, a silica rich rock which was produced by a volcanic eruption roughly 400 million years ago. During this period the newly formed hill was probably a small island surrounded by a warm, tropical sea. 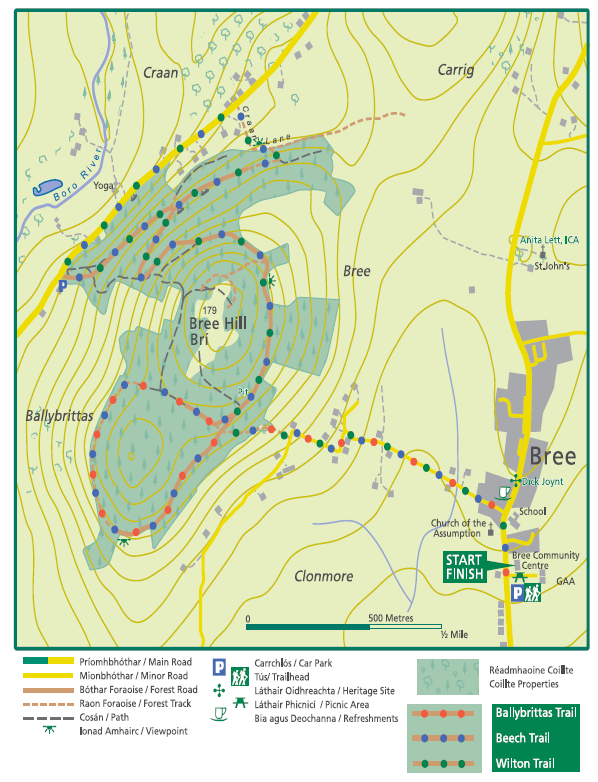 Bree Hill features three looped walks, individually waymarked, which start at the trailhead at the car park of Bree Community Centre in the village of Bree. These routes provide 23 km of mixed forest trails, offering peace and tranquillity and beautiful views of the surrounding countryside. It is important to note that Bree Hill is a designated venue for mountain biking and although the mountain bike trails are not part of the walking routes, one needs to be aware that some mountain bike paths cross the walking trails at a few points and due care should to be taken. Bree Hill was once part of the Alcock Estate at Wilton Castle and was a working forest before Coillte took it over. There were two lodges on the hill for the foresters and the Beech trees seen on the Ballybrittas Walk and the Beech Walk were part of that forest. It is also interesting to note that a 17th century road crossed over Bree Hill, the remains of which can be seen on the western side of the hill.